The Governor of the State of Kansas; born in Garnett, Kans., September 12, 1956; grew up on his family's farm near Parker, Kans., and graduated from Prairie View High School, Linn County, Kans. 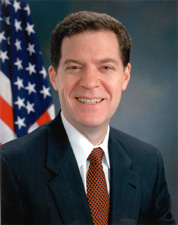 ; graduated from Kansas State University, Manhattan, KS., in 1979; received law degree from University of Kansas, Lawrence, in 1982; administrator, broadcaster, teacher, attorney, and author; Kansas Secretary of Agriculture 1986-1993; White House Fellow detailed to the Office of the U.S. Trade Representative 1990-1991; elected as a Republican to the One Hundred Fourth Congress and began serving January 3, 1995; not a candidate for reelection to the United States House of Representatives in 1996, but was elected to the United States Senate in a special election on November 5, 1996, to the unexpired portion of the term ending January 3, 1999, left vacant by the resignation of Robert Dole; resigned from the House of Representatives on November 27, 1996, retroactive to November 7, 1996, when his Senate service began; reelected in 1998 and again in 2004, and served from November 7, 1996, to January 3, 2011; was not a candidate for reelection to the Senate in 2010; Governor of Kansas January 2011-present. He and his wife Mary have five children.